Joniece Abbott-Pratt and Royce Johnson in a scene from "The Mountaintop," a drama about Martin Luther King Jr.'s last night. "I'm just a man, just a man," says a trembling Martin Luther King Jr. in Katori Hall's award-winning play, "The Mountaintop." It's a powerful piece of historical fiction, playing through April 26 at Geva Theatre's Wilson Mainstage. 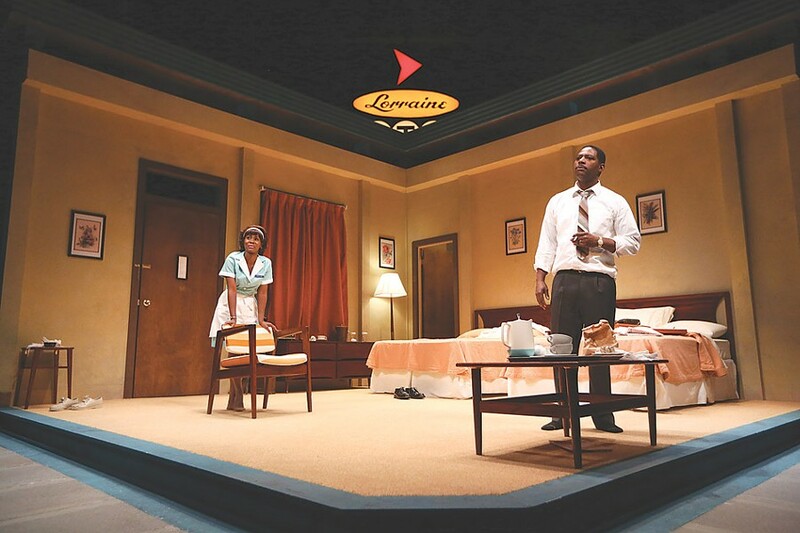 Martin Luther King Jr. (Royce Johnson) returns to room 306 at the Lorraine Motel in Memphis after reciting his momentous speech, "I've Been to the Mountaintop." The Geva production opens with a stirring excerpt, but as King hits the stage, a contrast occurs and the audience must divorce legend from man. "Get me a pack of Pall Malls," King yells. King shakes the rain off his weathered clothes as he settles into his room. He is fervent and continues to work, but exhausted. He coughs a smoker's hack and orders coffee, pacing and waiting with holes in his socks -- paranoid, as he checks his room for bugging devices. Camae (Joniece Abbott-Pratt), a spirited, young, and foul-mouthed motel maid, delivers his coffee and King coaxes her to stay. The two move around each other like a subtle dance. What begins as serendipitous flirtation develops into something more: a fateful rendezvous. Camae and King challenge each other's beliefs -- exploring culture, religion, and legacy. It's April 3, 1968: King's last night on earth. Forty-seven years to the day of MLK's assassination, which occurred on April 4, 1968, Geva opened "The Mountaintop," Rochester's debut of Katori Hall's landmark play. It premiered in London in 2009, and quickly became a hit, eventually winning Best New Play at the Laurence Olivier Awards. The work has been produced globally, including a run on Broadway in 2011 with Samuel L. Jackson and Angela Bassett in the lead roles. Now, Royce Johnson takes his turn as the man behind the legend. Johnson is a veteran of the stage and small screen, appearing in many Off-Broadway productions ("A Soldier's Play," "The Brother/Sister Plays"), and TV credits that include "Law & Order: SVU," "The Blacklist," and the upcoming "Marvel's Daredevil" (Netflix). His portrayal of King is complex and a treat to watch: grandiose but flawed. There's a familiar stance, a recognizable head tilt. The MLK we know from videos and speeches comes alive, but it's merged with something unfamiliar: King as a terrified human, sometimes harsh and rude, who in the quiet moments cannot shake the fear. Joniece Abbott-Pratt has performed all across the country and brings fresh energy to Camae. There is sensuousness to her portrayal. She is both simple and elegant -- a joy to watch. Johnson and Abbott-Pratt have a chemistry that gives the production a comfortable pace. It never feels drawn out, even without an intermission. When "The Mountaintop" ends, you feel cheated out of a few extra moments with this couple. Both characters do suffer, slightly, from a script that isn't quite certain what it wants to accomplish. And the production does a lot of work to remove the legend from the man, only to, by the end, (which, admittedly, is breathtaking) reinforce King as a legendary -- almost mythic -- man. Camae's character reflects a couple of weak points in the script, too. After her third foul-mouthed rant, her dialogue feels less natural and authentic and more like an obvious tool, or dependable crutch to break the tension with an easy joke: cussing in front of a reverend. Otherwise, "The Mountaintop" excels on almost every level. Robert Koharchik's set design is gorgeous and impressive: a big, beautiful highway sign hangs above the set, like a moon, with a double-queen motel room below, a balcony wrapping around it. Given King's imminent assassination, it's hard to ever feel comfortable watching this room, and that's the point. The bullet is due the next day, and we can feel the doom settling over every joke, laugh, and cough. Despite the production's (although emotionally effective) heavy-handedness, director Skip Greer's "The Mountaintop" is captivating and inspiring. It's a must-see production that will make you stand up and cheer. It serves as a reminder that our heroes were once also human, and it ends with a call: maybe we, too, could be heroes. That was King's vision: the one he saw from the mountaintop. Sitting in the audience, it is impossible not to feel the call.